he benefits of the present moment. Illustrations note XXVII, 250 p.
e benefits of the present moment. Donald McCown, MAMS, MSS, is a lecturer in the School of Health Professions at Thomas Jefferson University. He is Director of Mindfulness at Work Programs at the Mindfulness Institute at the Jefferson-Myrna Brind Center of Integrative Medicine, where he has been developing much of the theoretical and pedagogical material presented in Teaching Mindfulness since 2003, testing and refining ideas and practices with a wide range of populations in a variety of teaching formats. He also teaches MBSR foundation courses and advanced mindfulness courses for the general public, and teaches clinicians to teach mindfulness. A social worker trained at Bryn Mawr College Graduate School of Soial Work and Social Research, he also holds a Master of Applied Meditation Studies degree from Won Institute, has participated in professional training under the direction of Jon Kabat-Zinn, PhD, and has completed the most advanced teacher training at the Center for Mindfulness at University of Massachusetts Medical Center. He maintains a practice in mindfulness-based psychotherapy at the Jefferson-Myrna Brind Center of Integrative Medicine, with particular interest in the use of mindfulness in working with adolescents and adults with developmental disabilities and their families, and with artists and professionals negotiating anxiety and depression in their lives. tegrative Medicine. She co-founded the Mindfulness-Based Stress Reduction (MBSR) Program at Jefferson in 1996 and has been teaching MBSR for over 17 years to patients, medical students, college students, and healthcare professionals. She currently runs a Practicum in MBSR for Professionals and offers advanced mindfulness teacher training programs including internships and supervision for professionals integrating mindfulness into their work. 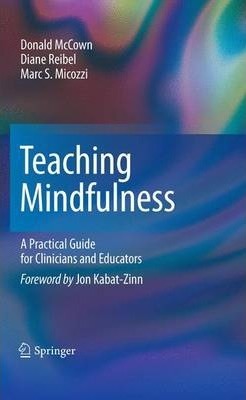 Dr. Reibel participated in professional training under the direction of Jon Kabat-Zinn, PhD, and has completed the most advanced teacher training at the Center for Mindfulness at University of Massachusetts Medical Center where she has been awarded MBSR teacher certification. She also holds a joint appointment as Research Associate Professor in the Department of Emergency Medicine and the Department of Molecular Physiology and Biophysics at Jefferson Medical College and studies the effects of mindfulness on physical and psychological health. Her research is published and widely cited in both scientific journals and the popular press. Dr. Reibel brings both a scientific foundation and heartfulness to her work. um of Health and Medicine and a Distinguished Scientist with the American Registry of Pathology in Washington, D.C. Dr. Micozzi is the author of Fundamentals of Complementary and Alternative Medicine, the first textbook on this subject for physicians and medical students, now in its third edition. He was the founding editor of the Journal of Alternative and Complementary Medicine. Dr. Micozzi has worked to foster communication and cooperation between mainstream and alternative medicine on issues of policy research and education.